January « 2010 « Geekorner-Geekulture. This is a good song, and more than that, the animation which is quite on the slow side, has things to look at, to look for. On Weight; Buffy versus Babylon 5. Back in 2007 I had several months of free time, and I decided to watch some of the unwatched DVDs that collected in our cabinet, courtesy of Amazon. I’ve watched Buffy the Vampire Slayer, all 7 seasons of it, and the first season of Babylon 5. For those of you wondering, I watched 4-8 episodes a day, so it didn’t take that long. So what I want to talk about here is “weight”, the weight of the shows. Now, what sort of weight is this? It’s a subjective feel that you have after the show ends. I am not sure if I can grasp what exactly I mean in a short amount of words, so I will make several passes around the concept, and hope that after that, you will know what I am speaking of, even if a definite definition will elude us. So, some books, some movies, they are “meaty”. After you watch them, you sit there and keep thinking about it, you go and talk to your friends about it, you go online and post lengthy posts about it (;)). The point is, the media item in question has a lot going for it, and you can keep talking and thinking about it for quite some time. This is sometimes not an attribute of the item in question, but rather how it touches upon something in you, the reader. Good media often touches on enough topics and in such a way that most people will have something to address in such a way. Comedies and Geekhood – Genshiken/The Big Bang Theory? All. 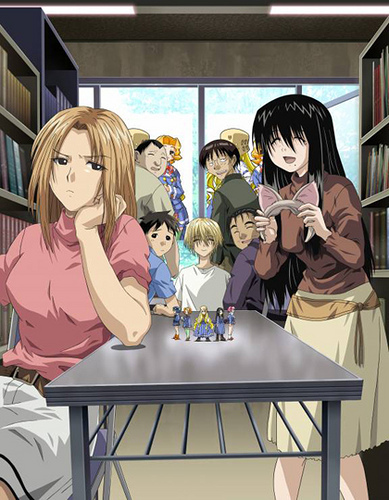 Well, this is not a post just about the geekier comedies which I love, such as Genshiken (which may not exactly be a comedy, but a slice-of-life series) and The Big Bang Theory, but it’s true for all comedies, and many stand-up shows as well, certainly all those who deal with current events and politics. I think intertextuality is what geeks thrive upon, and geeks who are into “geeky things” seem to respond and be proud of it, but having watched some comedies that deal with sports, I think it’s true for all geeks – all those who are nearly obsessed with a field respond well to shows that “reward” them for their knowledge, and which separates them from those who do not “get it”. Geeks do tend to take it one step further. Think of Genshiken, with all of the anime and mangas referenced, and which those of us who watched with subtitles usually had helpful notes explaining what is being referred to. And then you have the self-proclaimed “Big Geeks”, who scoff at those who do not recognize all such references immediately, or TV-Shows such as Stargate where things from the first couple of seasons will show up in season 8 (and then think of conventions where there are minutiae quizes, to prove you’re the biggest fan). This is not actually a Figure Friday post, but a post where I talk about Figure Friday a bit and ask for your input. As you may have noticed, the last time a Figure Friday post was written covered October 16th-22nd, and there had been a couple of major causes for that, which can be summed in one simple word. Time. There’s an upside and a downside to this being an issue of time: The downside is that I am a full-time student, and if I have a busy semester or busy week at school there simply cannot be a Figure Friday, and even before we sometimes had the post delayed (ok, after a certain point it was almost always delayed). The upside is that should I find ample time again, I could just go back to writing these posts. I expect the upcoming semester to be slightly easier on my time, BTW. The other point is that I doubt most of you understand how much time it takes to write a Figure Friday post. While I love having these posts written (and not just for the number of comments and views, which is much higher than usual for this blog), but I liked the accomplishment of having completed such a post. But how long does it take to get a Figure Friday post up, you want to know? From the time I begin working on it until it is published, well, let’s call it about 6 hours. Six hours. I go to Neko Magic and Kumo’s blog, and find and open all the interesting figure pages, then I try to whittle it down to the best and the worst, and sometimes the most interesting, I try to limit the number of pictures I use for each figure, so there’s more indecision and option-weighing going on. I write down my thoughts on each figure and then I try to find a place for you guys to reserve it, sometimes adding notes on how to go with special stores and deputy services, etc. And after it all, I go over the figure sales I find on eBay, various sites, the restocks, the new releases, the news of conventions, and this takes some time as well. Not as much as other things, but it all adds up. So now, here comes my musing about the options, things I could be doing to help get Figure Friday more on track. And yes, I know I promised Figure Monthly and it’s not out yet… I hope to get at least November and December, if not also October, next weekend (semester break begins, and I have a relatively small number of tests, on account of having numerous large assignments instead, whee!). Music: The Guild – Do You Wanna Date My Avatar? Well, I must say that I’m fairly disappointed in you guys, especially those of you who come from the Western Hemisphere, even moreso from those of you who come from, say, the USA, for not knowing, and if you do know, not mentioning this video, while mentioning the Touhou Bad Apple video (now with subtitles!). “Do You Wanna Date My Avatar?” is very much a geek video, and it also looks good. It uses stop-motion, which makes it look classy in some bits, a bit hokey in others, but quite stylized all the same. Personally, I didn’t like the stop-motion too much in Bad Apple, because with the shadows it broke the fluidity a bit much, but here it works. For those who do not know, the video shows the people who make up the cast of the online series The Guild as their characters, for they happen to play in World of Warcraft. Felicia Day who wrote it is an avid gamer, and those who watch The Guild or listen to the lyrics of the song can quite easily tell there’s “insider knowledge” of the game, so it’s “legit”, so to speak. Month in Review – December 2009: Purchases and Media. I am accepting donations of money, figures, and other non-food goods, apply at the closest Geek-Donation Association Chambers near you! Heh.